“Without FAITH it is impossible to please God, because anyone who comes to Him must believe that he exists and that He rewards those who earnestly seek Him.” (Hebrews 11:6) As a Christian, we are called to walk in genuine intimacy and full surrender to God – an insurmountable task lest we do so through genuine FAITH in Christ! I love to read Christian books which both challenge and sharpen the sword of my Spirit (Proverbs 27:17), and the one I am presently reading is entitled “Crazy Love” written by Pastor Francis Chan. In one of the recent chapters I was reading, Pastor Chan shared that one of his Bible College professors one day challenged his entire class with this thought: “What are you doing RIGHT NOW that requires (true) FAITH?” He shared that this simple question pierced his heart deeply because he “could not think of nothing in my life that required faith…and when (he) looked around, (he) realized that (he)was surrounded by people who lived the same was as (he) did” – that was living on his own strength (i.e. without FAITH)! That is a sobering spiritual observation for any of us to come too. But it takes honesty and truth of heart to reach that conclusion. Pastor Chan continued, “Life is COMFORTABLE when you separate yourself from people who are different than you…yet God doesn’t call us to be comfortable. He calls us to trust Him so completely that we are unafraid to put ourselves in situations where we will be in trouble if He doesn’t come through.” (Crazy Love, pp. 124) I believe that is why so many churches today often struggle with Biblical unity and fail to fully demonstrate God’s unconditional love to one another – people simply have the sinful tendency to gravitate toward those who are ‘just like them’ and avoid those who may seem ‘different’ – different because these people are more apt to challenge you to stay true toward your walk with Christ, different because these people seek to hold both you and themselves accountable to the Word of God and different because these folks are spiritually restless to ‘stay in the box’ because they truly yearn to journey ‘outside the box’ where only true faith can sustain them…it a land of Great Spiritual Adventure that has real risks, dangers, and many battles to face, but which holds the reward of pleasing the One who invited us to this journey called Life. For most believers, it is easier to hang out with the ‘crowd’ – the majority who prefer to stay right where they are – in the Comfort Zone just as Pastor Chan describes. From the first pages of Genesis through the last page of Revelation, God records the life stories of men and women who truly desired to live by FAITH … to break out of the crowds ... these were not folks who were perfect, but were genuine believers which longed for the journey that would only unfold as they obediently walked with God (e.g. Noah, Genesis 6:9)! Perhaps today more than ever, God is truly waiting to see whose hearts are sincerely resolved on pleasing Him and Him alone (not the majority in the crowds, rather the audience of ONE) – and the Word says that this can only take place when we seek to live for God through the journey of FAITH! Spend a few moments today with the Lord – ask Him is He ‘pleased’ with your life journey of faith with Him so far? Ask Him are there areas that you need to make adjustments (i.e. corrections to get back on the right path / life trail)? Then do what we so often miss doing when it comes to our prayer time … LISTEN to what He tells to you (“Listen carefully to what God the Lord is saying…” Psalms 88:15, NLT), and then simply do exactly what He says to do (James 1:22)! 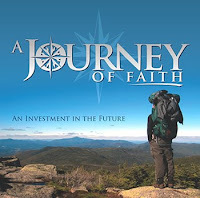 That's what a true journey of FAITH is all about! …Selah! Today's Spirit-led video is by CCM artists 4HIM and can be viewed by clicking on the on the song title, "A Man You Would Write About" - G3 for God's beautiful and spirit-filled gift of ministry thru Christian music!